This coffee will be fresh roasted for you. 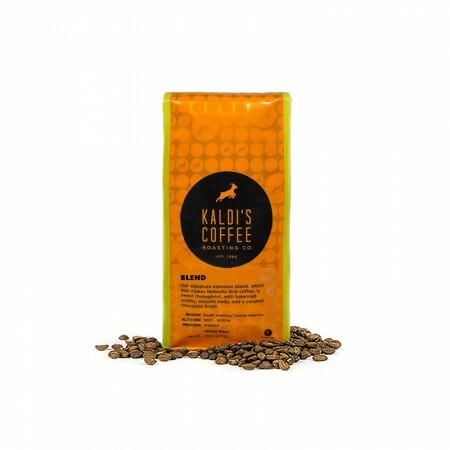 We expect Kaldi's Coffee Roasting Co. will roast and ship this coffee in 1-2 business days depending on their roasting schedule. 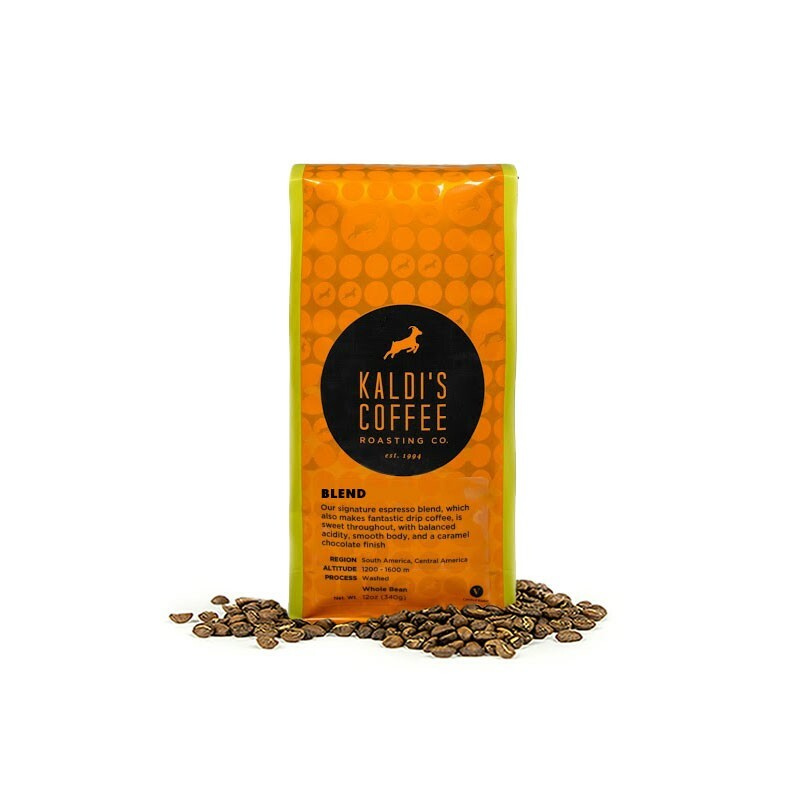 This is the French Roast brought to you by Kaldi's Coffee Roasting Co. A South and Central American blend of hard-bean coffees, roasted until most of their essential oils rise to the surface. A classic roast perennially favored in Continental Europe. This coffee is bold and full bodied with smoky and caramel notes. Amazing complex and rich taste! This one was not very good. There is no discernible difference between this and others that I have liked on paper. I wonder if there is a quality difference here. Smell was amaaaaaaazing. Loved the smell. Taste was good too but not as good as it smelled. Not as flavorful as I’d expect. A bit bland. I opened the bag and it smelled so good I didn't want to take my face out of the bag. And the taste didn't disappoint. I percolated this coffee and it was divine. Nice and strong with no bitter taste. Definitely can taste the smooth caramel notes. Love! Overall a well-balanced coffee. It has a quite mild flavor with slight sweetness, but still enjoyable. However, the roasted date is not exactly accurate (according to the sticker on the bag, it was roasted the day AFTER it actually shipped). This is my second experience with this coffee. Its not as dark as I prefer for my dark roast coffees. I also find the flavor profile to be flat. This coffee seems a little "lighter" on the roast than I was expecting given its a "French Roast". I wouldn't really call this a dark roast to be honest. It's not a bad coffee, just not dark enough for my tastes. Nice coffee but certainly not outstanding in any way. Smooth with a little caramel but comparable to some supermarket french roasts. First one sent was much better. This is a great French Roast. Nothing special about it but I love French Roast and this one is quite good. I like this coffee but i don’t think it’s exactly what I’m looking for. I enjoy the caramel nodes and excited to learn about more coffees that I like. I give it a 4.5. Too many flavors going on which make it taste less like coffee and more like a mixed specialty coffee. Another 4-star coffee - maybe even 4.5 stars as I think we like it more than the Colectivo Black & Tan. Nice a smooth with a little extra punch / boldness. Really nice roast. Dark, rich, and a little creamy. I LOVE this coffee. So rich and strong. Holds up so well. I think this is by far my favorite of all the coffees delivered to date. It has just a tiny bite but enough to wake you up. Big fan of Kaldi, love the organic coffee. Don't like French Roast quite as much. This is the exact opposite of what I want in a coffee. It was sour and gave me heart burn when I drank it. It makes me think this review process is a big algorithm and has no contribution from an actual coffee consultant, or maybe one that has not tried any of the recommended coffees. I'm very disappointed so far in my subscription because I love dark coffee, but it seems like this company thinks French roast is the only dark coffee available. It is especially disappointing because I can buy better coffee at Starbucks, and I'm not very excited about continuing my buisness there. I don't know what to tell you to fix this but the coffees you're sending me are getting progressively worse each time. I'd like to select the next three months myself, which is disappointing because I was hoping to rely on the expertise of this company to explore my coffee range. Samantha! This is an outstanding coffee. It is rich, strong, yet non-acidic, and full of flavor. I am not very trained in coffee tasting, but I know what I like, and I was surprised at the bold and smooth flavor. Spot-on! Didn't like the after taste. Not bold enough. Smoky and caramel-y perfectly describe this. I could smell the caramel notes through the box! Good stuff. This one is a keeper! Nice and dark with little acidity. Exactly what I was looking for. I like this one. A little more bold than the last one. Maybe try something a little lighter on the next round. Very nice. Deep flavor, but not overly bold. Acidity seems about right. Some natural sweetness coming through. Overall, like it a lot. Probably the best beans we have received thus far and that is saying a lot considering the competition. A good balance on the dark side without overpowering. This is a decent French roast coffee. I found it to be bitter sweet, with a woody after tone, low acidity. I'm not tasting the caramel tone. It's a quality dark roast, but I prefer more flavor. I have brewed this with my Chemex and Hario V60. Well balanced dark roast. I really like the bolder flavor and how it's not so overpowering that it needs a splash of milk to be balanced. The caramel notes were the right amount of sweetness. And the smell was amazing! Better than the Ethiopian coffee of last shipment. Not as full bodied as I would like but happy that it didn't have strong sour notes. More pleasant aftertaste. This was my favorite so far, of the few I've received. Smooth cup of coffee. This roast wow'd me! The deepness and darkness and the viscosity while drinking it is definitely hitting the right buttons for me. This is along the threshold of darker roasts that I love. I think if I drank anything darker it might just be overkill but this one is awesome! Totally full bodied and just enough smokiness and good sweetness to make a overall enjoyable cup. For some reason, this one felt too bland. This was my favorite so far, of the few I've received. I always seem to enjoy French Roasts and this was no exception. Good, rich flavor, plenty of body and a bit of smokiness. Typically, I'll put a very minute amount of milk with my coffee to take the edge off, but I didn't want that with this. We did not enjoy this coffee as much as the other ones we have received. Not really impressed. Very bland. Not a lot of the richness and the boldness that I expect from a french roast. Would not buy again. Excellent coffee. Great bold flavor with a good balance. This is one of the better coffees I've received. Excellent French Roast, Full body, with a nice rich finish. Good dark coffee without being overwhelming. I like this coffee quite a bit! We liked this one! Very smooth. I've made it several ways and the flavor is pretty solid any way I make it! I think we could build on this with an even richer coffee flavor! I have LOVED both Kaldi's blends I have gotten. So smooth with low acidity. Yummy! Wasn't my favorite. Didn't appeal to me for whatever reason, somewhat strange aftertaste. I'm a novice, however, so no worries! This is an excellent cup of coffee. The body provides a wonderful smokiness, but doesn't overpower the subtle flavors underneath. There's a little bit of sweetness to this coffee that I really appreciate. The last three have been excellent, keep 'em coming! I enjoyed this coffee. It was rich and nutty, with a pleasantly notable almond finish. However, it did not keep well. It lost it's flavor much more quickly than most other choices for some reason. It was stored identically to my other coffee. So, I don't know if the roast date was further back than indicated, or whether there is something in their roasting process that hastened the loss of freshness. A pretty good one! I'm totally out though. Whats coming next! Excellent blend. I was impressed right off the bat because the packaging looks awesome, smelled great when I opened it up, and best of all contained beans that were not covered in oil like any other "French Roast" I've seen.As espresso, this is neck and neck with my all-time favorite blend, Orphea by Maromas. The dominant quality is its smoothness, It has a nice, bitter chocolate flavor with a slight caramelly sweetness and pepper undertone. Kind of a deep, roasty flavor with a kick and just enough sweetness to keep the edge off. It has an excellent, creamy body with a nice crema. What most impressed me about this blend, however, is that it never picked up a sour or offensively bitter flavor, even as it cooled.While honestly this does not need milk to be thoroughly enjoyable, it does make an excellent latte or cappuccino. I did find the first latte I made with it to be on the weaker side for my preference, however I think I used a little bit more milk than I usually do, and I haven't gotten to play around with the grind size on my machine to perfect it yet. That being said, it was excellent nonetheless. It was creamy with a little bit of spice shining through and altogether one of the best milk-based drinks I've been able to create with my lower-end superautomatic machine at home. It would pair beautifully with a medium bodied cigar if you're in the mood for a fancy evening.As coffee, I have only brewed this with an Aeropress to date, but a lot of that is because the Aeropress absolutely kills it when it comes to darker roasted coffee. It's strong and has a pleasant bitterness along with a caramelly sweetness that lingers a little bit, and you still notice the creaminess I mentioned it has as espresso, So I'd imagine even those who don't normally drink their coffee black would enjoy this. This is much heavier and darker than I am used, but it is good in it's own right. Makes a great cold brew! Quite weak for a French roast; picked up the caramel notes, but not the complexity. Solid 3.5 stars because this is a delicious cold brew coffee, but it did not stand-up as hot morning cup. The caramel notes are better captured as a hot brew, but overall it's bold taste comes through cold! Wow, excellent! Not too strong like a lot of French roasts. A wonderful roast from a really solid company. I love the darkness of this rich blend of fair trade beans that is low acid. I almost get graham cracker in my mouth. I enjoyed this more than the Red Rooster one as it didn't taste as dark nor smoky. I would still like to try some just slightly lighter roasts so that everything isn't French Roast. Bold flavor. It's become one of our favorites. I like this one the best so far! very nice!! substantial but easy to drink! Dare I say this is my favorite then my favorite changes. Loved this coffee! Smooth, velvety, rich and earthy. The kind of coffee that you enjoy waking up to, or as an after dinner dessert companion. very good! Loved the taste and smell of the whole beans, ground coffee, and especially the brewed coffee. Drip brewed. Good taste comparable to Panther; however, Beans are oily which makes prep/cleanup a little more involved. Our favorite so far as far as French Roasts go. Not bitter at all. enjoyable with cream or black. Nice flavor and body for a French Roast. Well balanced dark roast. Could be a little stronger as it had good flavor, just a little more muted than I would prefer. I did not expect to love this as much as I did, but the texture was awesome and there was no bitterness whatsoever! Smooth, pleasant. Full coffee, definitely picked up on the smokiness but neither of us got the caramel notes. Great smell during brewing. Very complex and mouthful taste! It is not as dark and smoky as a common French roast, but the thick crema and rich aroma of the espresso made this bean a pleasant experience for me. didnt care for it at all. Very plain. Meh - tastes a bit rubbery to me. Bad aftertaste and not very good beginning either. Love how smooth it is. Interesting, almost herbal, aftertaste. Great breakfast coffee!! I love this coffee! It's full-bodied and strong with no acidity, and the aroma is equally wonderful. This is a great coffee! I can taste the caramel undertones and it's super smooth. It could use tad more flavor but it's REALLY good! Excellent. By far the best coffee mistobox has sent my way, and a shame it took until my 5th month to finally find the sweet spot. Color of beans is lighter than described, but flavor is full, rich chocolate and hazelhut, no bitterness, very smooth. Not a big fan....Like a darker roast. Lightest French roast I have ever had. Who would've known that I would've found a new favorite brewer? I've separately ordered Kaldi's Natural High at least half a dozen times the past few months in addition to my subscription, and now their French Roast gets five stars as well. Love it! average taste, not particularly bold. Perfectly fine, but also perfectly unremarkable. Only brewed via french press and perhaps could have explored alternative brewing options, but overall just not a memorable brew. Like this one a lot. Good dark roast! This is a firm brew - satisfying, bold but never harsh. Excellent round flavor. Classic European - if you can't afford a trip to Graz or Brugge - brew a cup of slow drip Kaldi. A keeper in the repetoire. Overall i rate this 3 out of 5. It just didn't make me feel like i was in a warm cozy cabin wrapped in a blanket. I cant seem to put my finger on it but this coffee makes me feel incomplete. Maybe I'm not a French roast / Italian roast person. It's really good coffee, but that little tanginess in the aftertaste isn't my thing. Also, like some others, these beans create a lot of flaking and mess in grinding. Others grind clean. Why is that? LOVE LOVE LOVE this French roast! I'm enjoying the nutty taste notes for sure. Best dark roast I've had in a while. I liked this one a lot. It is much lighter than the dark roasts I'm used to, but tastes like caramel! Different, but very good. Much closer to my taste than the last coffee I received. I would like to see a little more depth and smokiness without it being overbearing. Reminded me of typical european cafe coffee, light but dark in flavor. Recently started making Turkish coffee and this French roast was excellent... even while picking grounds out of my teeth. Excellent taste, slightly spicy in my opinion. Much lighter than your typical French Roasts, organic, highly recommended! Loved this coffee, full body and strong and dark. Just what you need in the morning. Really enjoyed this cup. Flavor was deep and complex without being overpowering, subtle hints of chocolate and caramel. So far my favorite. This was a really good French Roast. Very complex flavors and I received compliments when I made a latte for a friend. This was an interesting and surprising blend for a French Roast. The nose reminded me of chocolate with a hint of nuts. The beans are more typical for a French Roast - dark and oily. While I found the flavor to be enjoyable, it is not the bold, smoky experience I was expecting. If anything, I found the taste to be on the lighter, sweeter side. Excellent cup of coffee, very well balanced across all the qualities.